James Harden entered the NBA pantheon on Monday night. Riding a 29-game, 30-point streak, the reigning MVP — who was nursing a sore shoulder, too — scored 11 points late in the fourth quarter to finish with 31 points in the Rockets’ 120-104 win over the Dallas Mavericks. As Harden’s 30-point streak starting mounting, Rockets GM Daryl Morey aptly coined it, “The Unguardable Tour,” telling reporters he wouldn’t shave his beard until the streak ended. 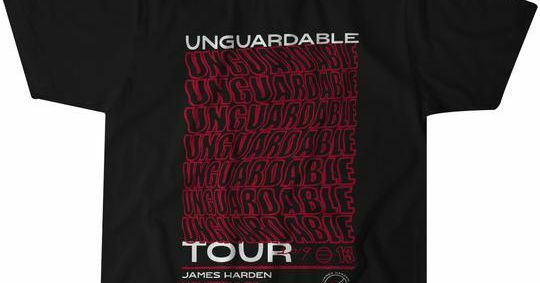 Now, The Unguardable Tour has a new T-shirt and hoodie for Harden fans to pick up as they continue to enjoy his masterful run of 30-point games. By the looks of it, this streak isn’t ending anytime soon. After getting off to a rough start this season, the Rockets have turned it around and, with Harden’s historic play, have propelled themselves back into the Western Conference’s top tier. The Rockets are 21-9 during Harden’s 30-point streak and have jumped from 14th to fourth place in the West. The next stop on the Tour takes place this Wednesday, when the Rockets play the Minnesota Timberwolves before they head into the All-Star break. Looking for some more Harden merch to celebrate his crazy run? We’ve got you covered with a few recently released items to check out.